Weltklasse Zurich meet director Patrick Magyar. The third season of the Diamond League has come to an end, and once again the hammer throwers have had to watch from the sidelines. As the only track and field athletes excluded from the Diamond League, hammer throwers have always protested the current state of affairs. Through the efforts of those like Kathrin Klaas, the movement has slowly gained more publicity. And, after three years, the Diamond League has still never given an official statement as to why the hammer throw has been excluded; the closest thing to that was a footnote to the initial press release stating that the hammer throw would be excluded for “infrastructure reasons”, whatever that means. 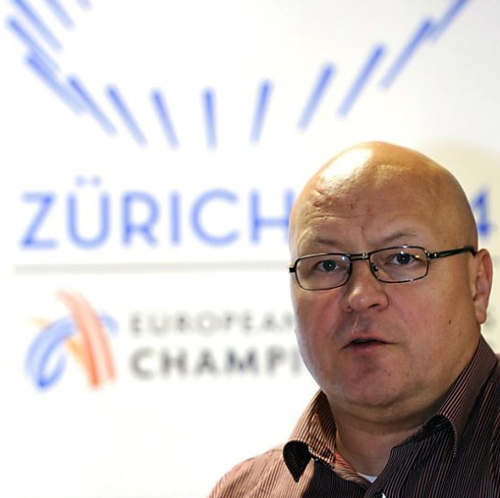 As time has gone on, Patrick Magyar, the outspoken director of the Weltklasse Zurich Diamond League meet, has let out some snippets of his views on the hammer throw. 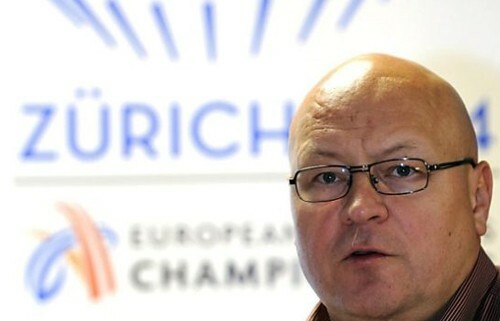 Magyar is a man we need to convince about the hammer throw since he not only runs the biggest Diamond League meet, but serves as vice chairman of the Diamond League and was CEO for the 2014 European Championships. Last year in an interview with the Basler Zeitung, Magyar said that the future of athletics should include less events, particularly the heavy throwing events since he does not feel they are as entertaining in a stadium. The hammer throw, for example, has fewer and fewer athletes so it makes less sense to include it in the big meetings. Swiss-Australian coach Jörg Probst has the full translation here. As I told Jörg, is it that the hammer should be excluded because it is not popular, or that the hammer is unpopular because it is so often excluded? As I documented in detail, the hammer throw has grown quickly in both popularity and participation once it started to be included in more meets in America. Maybe meets like the Diamond League are causing the problem instead of just reacting to the current trends in the sport. Leichtathletik: The hammer throwers, led by Kathrin Klaas, have recently pushed very hard for the inclusion of their event in the Diamond League. Will this occur in 2013? Magyar: No, and not in 2014 either. Magyar: We had to take over the shot put from Brussels due to an international football match taking place there. The shot put was not approved because of the pitch. This demonstrates the problem. When a stadium belongs to the city, it gets difficult. Furthermore the heating under the grass is always getting closer to the ground. If it gets damaged, we start talking about repair costs in the six figures. On the other hand is the requirement for an extremely tall cage. This means the hammer throw has become an unfeasible event for a meet. In Zürich the hammer competition would have to be concluded before the stadium opens so that the cage can be dismantled. Zurich has been an extremely strong supporter of the hammer throw. I train at a city-owned and -maintained facility. There we have the only facilities managers that have ever asked me what they can do to help me, rather than place limits on what I can do. Every Friday a three-person crew spends the whole day to repair our throwing field by replacing divots and keeping the field in great shape even though it is used exclusively for track and field. Our cage net has been repaired and replaced before it is even needed. They also installed a temporary net that we can throw into when there are conflicting training times. Rather than telling us not to train at those times, they developed and implemented this solution and have seen been coming up with ways to improve it before I could even give them feedback. They truly think of the athletes first. It is true that the rise of heated pitches might pose a problem for the hammer throw. However the pipes in Zurich (and most stadiums) are not as close to the surface as many would make you think. I am not an expert on this topic, but at a depth of 27.5cm (11 inches), the piping should be safe from damage. Because the field is used for athletics, the heating is actually deeper than most fields. I have never seen a hammer sink half that far into the ground of a well-maintained field, either in a dry Zurich summer or even in the wettest of conditions. As the grounds crews in Zurich have already proven to me, they can repair anything, even a field that receives tens of thousands of throws a year. A half-hour competition should be no problem and should cause less damage than a soccer match played in heavy rain. In those cases, they often need to resod the field entirely. This is a risk that likely could be insured against and is obviously a risk Zurich is willing to take in 2014 since the hammer throw will take place at Letzigrund stadium for the European Championships and it would make sense that they should at least test the field before then with another hammer competition (it would be terrible for a pipe to burst mid-competition, create a lake or fountain in the middle of the stadium and delay the internationally televised event). The cage is another issue mentioned by Magyar, but again I do not see a huge problem. The cage used for the women’s discus at this year’s Weltklasse Zurich is the same cage I use for hammer training and hammer competitions in Zurich without any problems. In fact I had to train for one week without a cage in August as they borrowed it from our training facility. It did not seem to hinder the meet too much this year as it was quickly taken down before live television coverage started. Even if a new cage is required, the cost would be a sliver of the multi-million dollar budget of his meet. And several other Diamond League facilities have hosted the hammer throw in the past few years already, thus proving they are able to do it (off the top of my head at least half of the the stadiums have hosted hammer since 2000, including Eugene, New York, Doha, Birmingham, London, Helsinki, and Stockholm). The Diamond League only includes each event at half of the meets, so even if a few facilities could not host it there is still a chance for the event. As I’ve said many times, there would likely be less debate about the hammer throw if I or another Swiss thrower broke 80 meters. It is feasible to host the hammer, but the meets are not under enough pressure. The two Swiss diamond league meets are always looking for local stars to showcase and now there is no Swiss athlete among the world’s top 10. Organizers would go out of their way to accommodate a Swiss star. Even an emerging star such as young shot putter Gergori Ott was allowed to throw his junior implement against the world’s best shot putters in Zurich for the past two years. But this will not happen soon and none of the countries hosting a Diamond League meet have their top stars in the event, let alone an Olympic medalist or finalist. But creating this type of pressure will take a long time. What we can do now is continue to show everyone there is not a good reason to exclude the hammer throw and keep building support for its inclusion. Great rebuttals. Check with Lance Deal; he designed the “thunder dome”-collapsible IAAF discus cage-for Hayward Field so they could drop it down when discus finished. West grandstand could then see pole vault & track back stretch. Bet it could be done with hammer as well. The irony-Prefontaine is Diamond Meet & puts its own world class hammer event as “adjunct” to meet. Pursue 2 pathways: 1) Diamond League, 2) Separate throwing meets to build enthusiasm, big media & social media, etc. Regards. Keep up the fight!! Interesting topic and I will weigh in on this both from the practical and interest standpoint. While I understand the reason for heating under the grass etc. it would seem that there are enough advances in this sort of technology that the pipes are not within 6 inches of the surface. So I agree and stand by Martin in the statement about the depth of heating aparatus. Hammers at international competitions like the World Championships and Olypmics (or any other meet that I have see or been to) typically breach the surface up to 2-3 inches and certainly not more than 6 inches if the surface is very soft. You can SEE the men’s hammers (the heavier of the two implements by almost double) bounce out of their holes in the turf and are never lodged so deep that officials have to labour terribly to get them out of the ground. If the surface was that soft, then football would be difficult and unsafe to play on anyway. Heating apparatus can be deep enough to keep the ground warm and even with degrading soil levels there needs to be so much dirt between the heat source and the grass or the grass would dry out too quickly or even die. Moreover, the JAVELIN goes deeper into the ground with a much sharper end and can do just as much damage to the underground infrastructure – if not more – because of the implement’s pointed tip. So this argument – while a moderately legitimate concern – seems to be stretched just a bit too much in reason so as to serve the purpose of the IAAF and Diamond League organizers. I have actually seen the Shot Puts dig fairly deep but that event is not really ever left out, of course since it is a short throw it can be hosted at an alternate (albeit VERY WELL PUBLICIZED) venue within the Diamond League structure. Seems to be such a weak argument that the (boring with the same 4 guys always on top) javelin can stay but the hammer has to stay out because of heating pipes below the surface. On the issue of interest – have you ever watched a 5,000m or a 10,000m? Even with pace setters the event is still very long and boring to watch for 12.5 or 25 laps. While I understand that running is popular on both sides of the pond, having distance events with incredible frequency often becomes boring and the same people are winning all the time. In fact the Diamond League coverage moves away to show other field events after about the first 800m of the longer races. So why not show them more. Field events are exciting to watch as long as (just as on the track) the announcers help educate and draw attention to the event and help paint an exciting picture just as they do on the track. Hammer throw in particular is incredible to watch, the complex and unique movement through the circle and the very loud screams from the athletes actually draws MORE attention. What’s more is that in Hammer Throwing the competition could go to anyone in the top 10 or 20 in the world in that meet. So why not show it more. Furthermore, the removed or dismantling of the cage 1. is not necessary if you just drop the net and 2. is only in the way for a VERY brief second in the field of vision. Plus cage designs now have hinges on the bottom of their poles so they can be laid down with minimal effort and worker-time to do so. Overall if the IAAF has a mandate to promote ATHLETICS as a sport this needs to be more than promoting “running and road racing”. In order for this sport to flourish for decades to come is to promote the sport in a way that people see that there is likely and event for just about ANY TYPE of person. For all shapes, sizes, strengths and weaknesses Athletics is the mother of all sport…so why not showcase ALL the athletes and ALL the events in it? Javelin has injured more people in the last 10 years than Hammer Throwing has in a big stadium. Hammer throwers have their own share of mishaps etc. but the real consideration here is that with hammer being so complex. The athletes also have to be in complete control and aware of what they are doing. Thus, that higher level of complexity at the international elite levels comes with it a higher ability from those athletes to ensure that they can of course throw as far as possible, but as a result keep it safe – and when things do go wrong, the cage protects the crowds and officials. The way cages are made now they are safer than ever and risk is very well managed. So to those organizers I say man up and be real before you let the nonsense reasons dictate how meets are run. By creating a self fulfilling prophecy, there is no doubt you will be rid of whatever events – and interest in them – in no time. It’s time to get with it and it’s time to understand the large picture around this sport. The sport is bigger than heating pipes, football matches and whining organizers. It appears to me that waiting around and begging to be involved is not working. Maybe you should start your own hammer league and include throws and create your own excitement, kinda like the one you threw over the river. Maybe it should not be in a stadium. It’s an exciting event. If you throw, they will come. People like Magyar are the cancer of this sport. I hope someone drops a shot on his foot. This last summer, USOC made the decision to hold the US Olympic trials for the Hammer Throw at the campus of NIKE, located about 100 miles from the rest of the Olympic Trials i Eugene, OR. There were far too many complainers prior to the event being held. What took place was nothing short of awesome. Held the day before the Olympic Trials officially opened, the event was standing room only. I don’t recall the numbers, but I think it was somewhere in the 5,000 – 6,000 range, for a single event. This was accomplished at the same time that the event was being broadcast live on TV. Nothing but rave reviews after the fact, and looking forward to the next time this takes place. Magyar is not the guy to be making decisions. He has no vision of what can be.